This exceptional coffee was selected as the No. 19 coffee on Coffee Review’s list of the Top 30 Coffees of 2018. 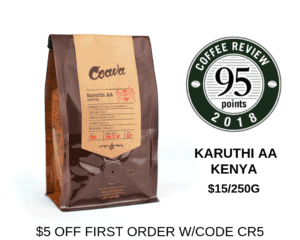 This coffee is available exclusively as a part of the Barrington Coffee Curated Collection, which includes four ounces each of three distinguished coffees for $39.95. Produced at La Berlina Estate from trees of the botanical variety Geisha (also Gesha). With its bold, boat-shaped beans and distinctive floral and crisply cacao-toned cup, the Gesha continues to be one of the world’s most sought-after coffees, and the Esmeralda versions remain among the most authentic. This is a wet-processed or “washed” version, meaning the fruit skin and pulp were removed from the beans immediately after harvesting and before drying. Barrington Coffee is an artisan roaster dedicated to elite coffees, fresh delivery and roasting that foregrounds the coffee and not the roast. Visit www.barringtoncoffee.com or call 800-528-0998 for more information.